C.J. Erickson Plumbing Co. Sponsors National Rebuilding Day | C.J. Erickson Plumbing Co.
For many homeowners, making household repairs can be a daunting and cost-prohibitive task. In addition to searching for and securing a qualified contractor, this process may include several weeks when a home may be somewhat uninhabitable. 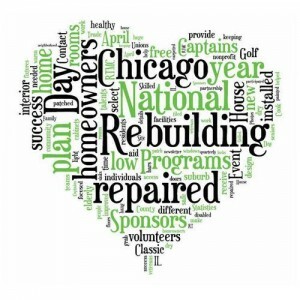 However, in celebration of National Rebuilding Day – April 26, 2014 – more than 3,500 volunteers will apply a days-worth of elbow grease to make major repairs in 70 homes, three nonprofit facilities and one landscape area in Chicago’s West Englewood neighborhood and the Cook County suburb of Riverdale, Illinois. Dispatched by Rebuilding Together* Metro Chicago, volunteers – representing more than 100 corporations, skilled labor unions and service organizations – will paint, re-route electricity, and provide plumbing and carpentry repairs in just one day. Rebuilding Together is the nation’s leading nonprofit working to preserve affordable homeownership and revitalize communities. This year, more than 10,000 houses and non-profit facilities across the nation will be painted, repaired, weatherized and revitalized by over 200,000 volunteers. 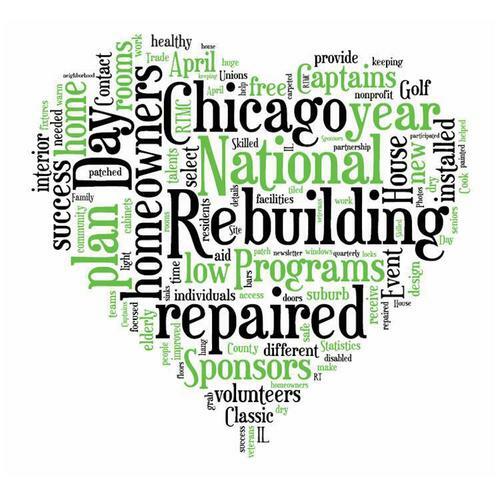 Since its inception in 1991, Rebuilding Together* Metro Chicago has cumulatively worked in over 1,200 homes in the Chicagoland area. This year’s sponsor list includes Starbucks Coffee Company, Takeda, Siemens, TransUnion, Power Construction, Walsh Construction, MWH, Northern Trust and Peoples Gas, among others. Additional support is provided by labor unions such as the IBEW Local 134, the Chicago Journeyman Plumbers Local 130, and the Chicago and Northeast District Council of Carpenters – who have all contributed greatly to the success of this year’s neighborhood upgrades. For more information or to support Rebuilding Together* Metro Chicago, call 312/201-1188 or visit www.rebuildingtogether-chi.com. Rebuilding Together* Metro Chicago works to make a sustainable impact in partnership with the communities where volunteers serve, while improving the homes and neighborhoods of elderly, disabled and low-income residents so that they may continue to live in warmth, safety and comfort. *An affiliate of the nation’s largest volunteer organization preserving and revitalizing low-income houses and communities. AmeriCorps Alums Chicago Independent Recycling Services, Inc.
BearCom Lend Lease (US) Construction, Inc.
C.J. Erickson Plumbing Co. Littelfuse, Inc.
Command Transportation Primera Engineers, Ltd.
Connie’s Pizza Professional Decorating & Painting, Inc.
Cook County Bureau of Economic Development R 4 Services, Inc.
Cook County Office of Capital Planning and Policy Scientific Home Services Ltd.